Powerful Stress Management principles for all of God's people. Are you feeling stressed, Christian? God promises to give His children special help when it comes to dealing with stress. Are we taking full advantage of the gifts He has given us? Are we living out the peace, joy and victory that is available to us? What exactly is stress? And where is God in our stress? Where does stress come from, and how does it really affect us? More importantly, what does God have to say about stress? Isn't stress like the impartial rain, falling on both the just and the unjust? How would a Christian handle stress differently from anyone else? Find out in this full length Christian book, with workbook-style activity pages after every chapter... easy-to-follow activities that make the stress-busting principles of Christianity come alive in your heart! Whether your stress is acute or chronic, whether it is affecting your health or your relationships, you will love this powerful resource from inspiring coach and author James Klotzle. 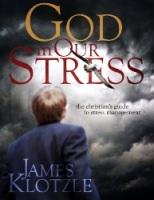 James has wrestled the "stress monsters" in his own life and has defeated them with the help of God! James went on to pursue undergraduate and professional degrees in psychology and relational therapy, and now works as a Christian life coach and family therapist, specializing in stress management, relationship and communication issues. One of the great joys in James' life is sharing the Hope that drives him forward. This passion is exhibited in everything that James writes... from the inspiring stories of his days as an emergency services worker to the scriptural truths that have brought new life to generations of God's children! This full-length Christian book includes a Printer-Friendly Activities Section... great for individual use or group studies. James Klotzle and his growing family live in St. Paul, Minnesota where he works as a Christian life coach, counselor and author. After experiencing burnout and traumatic stress as a firefighter and emergency medical technician, James spent years seeking the healing, peace and joy that we are promised as children of God.